NHL '98 has an array of features that you would expect from an EA Sports title. All 26 NHL teams from 1998 are in NHL '98, along with 18 international teams and two division All-Star rosters. EA uses the real NHL players and stadiums as well, resulting in the ultimate NHL experience. Each game starts off realistically enough, with the last few notes of the National Anthem being played (either American or Canadian, depending on which side of the border your team is from), and the game contains an amazing amount of play-by-play commentary. NHL coach Marc Crawford developed the plays, so you can expect a ton of realistic plays you can execute. You can also change your offensive and defensive strategies during the game with the press of a button. The players have received a bit of a graphical overhaul, so expect even more up-close-and-personal looks at some of the NHL's pretty boys and ugly thugs. You can also take on up to five friends in the Multiplayer mode. 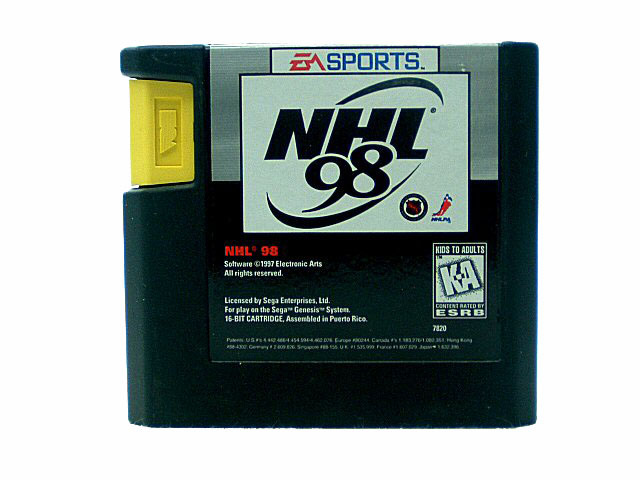 Electronic Arts' longstanding hockey franchise comes to a 16-bit end with NHL 98, the seventh game released in the Genesis series. While the same engine found in both NHL 96 and NHL 97 is used in this game, there are a few new features that set this title apart from the rest. These include the following: three different game speeds to choose from; a two-line pass rule; a "Coaching Style" menu allowing players to apply one of five strategies (offense, defense, balanced, all-out offense or all-out defense) to different lines; updated team rosters to reflect the 1997 season; player ratings based on the 1996 season; automatic goalie switching; and enhanced penalty awareness. Returning to the game are 26 NHL teams, two All-Star squads, and three National teams (United States, Canada and Europe). Battery backup will track statistics, season progress and All-Time Records in thirteen categories, including "Most Breakaways," "Fastest Goal" and "Best Shooting Percentage." The seven game modes consist of Regular Game, Playoffs, Best-of-Seven Playoffs, Season, Shootout, Practice, and Skills Challenge. Complete roster management lets you trade, create, release or sign players, so you can put yourself in the game if you so desire! Up to four players can play simultaneously with the 4-Way Play adapter.